This edition of The Enchiridion on Faith, Hope and Love comes complete with a Touch-or-Click Table of Contents, divided by each book and chapter. 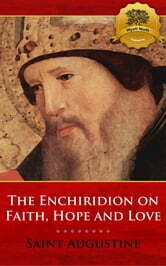 The Enchiridion, Manual, or Handbook of Augustine of Hippo is alternatively titled, "Faith, Hope, and Love". The Enchiridion is a compact treatise on Christian piety, written in response to a request by an otherwise unknown person, named Laurentius, shortly after the death of Saint Jerome in 420. It is intended as a model for Christian instruction or catechesis.As the title indicates, the work is organized according to the three graces necessary for the Christian worship of God: Faith, Hope and Love. Under Faith, Augustine explains the use of the Apostles' Creed, in teaching Christian doctrine and in refuting heresies. Under Hope, he briefly explains the Lord's Prayer as a model of Christian prayer. The final part is a discourse on Christian love.This classic work, The Enchiridion on Faith, Hope and Love, was translated into several languages and played an important role in the spreading of the ideals of Eastern and Western Christianity. You can purchase other religious works directly from Wyatt North Publishing. Enjoy.